Gladstone Central State School will be the lucky recipient of a piece of Commonwealth Games history. As part of the Queensland State Government’s Embracing 2018 Sports Assets Legacy Program, the Carrara Stadium Athletics Track has been repurposed as long jump run-up tracks for 50 state schools, and Central State School is one of them. The school will receive 40m of long jump run-up track and sand pit. The project is expected to be divvied up and installed at the school by late December. Each time Gladstone Central State School holds their athletics day or even athletics training the students will be reminded of the history of the long jump run-up and its significance. The installation of the track will improve both the sporting capability and capacity of schools and reduce maintenance on their long jump run-ups. Member for Gladstone Glenn Butcher said it was fantastic to see the track being distributed to the successful schools. “Gladstone Central State School was one of the successful schools and will now see the track installed at no cost to the school,” he said. “This is just one of the many Gold Coast 2018 initiatives that will create a sporting legacy across the state, giving children across Queensland the opportunity to use world-class athletics infrastructure. 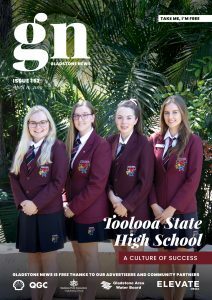 Having such world-class facilities will also give Queensland a home-ground advantage to train and retain our state’s best and allow students, schools and community organisations to continue to benefit from this investment long after the Games,” Mr Butcher said.